Professional care assures the durability of your Alpen Gold diamonds and maintains efficiency after repeated use. 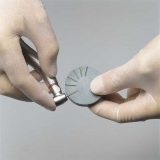 The Alpen Diamond Cleaning Disc removes slurry and filling remnants. Simply place the diamond flat and run at medium speed pressing gently into the disc.